It has many nicknames: “The Microphone,” “The Texas Dandelion,” “The Dallas Disco,” and most commonly, “The Ball.” No matter what you want to call it, Reunion Tower is not only the most iconic part of the Dallas skyline, but the necessary first stop for visitors and newcomers to the Big D.
Reunion Tower is to Dallas what the Empire State Building and the Statue of Liberty are to New York City: an instantly recognizable icon. Another fascinating, if somewhat disappointing, trait that the Statue of Liberty and Empire State Building share with our Reunion Tower is that most of the people who have spent a lifetime gazing up at these emblematic towers have, in fact, never been there. 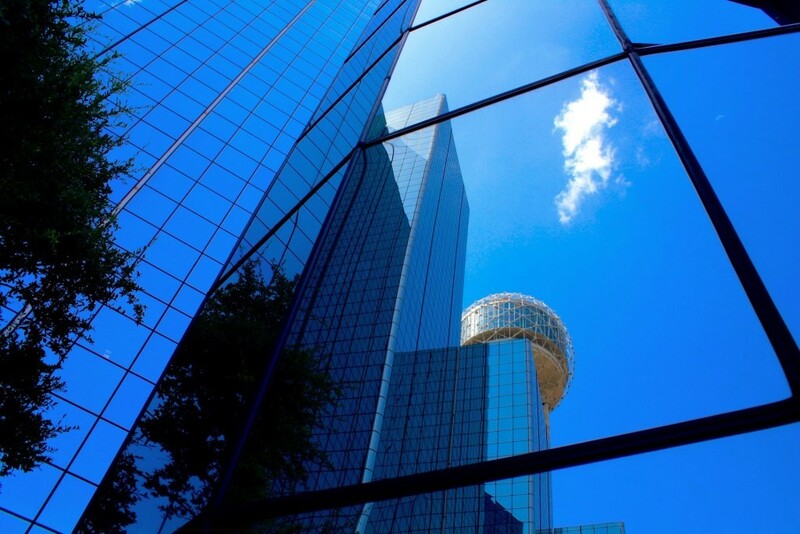 Like so many other Dallasites, I have grown up under the watchful eye of “The Ball” and until this week had never taken the 68-second elevator ride to the top to get a bird’s-eye view of Dallas. 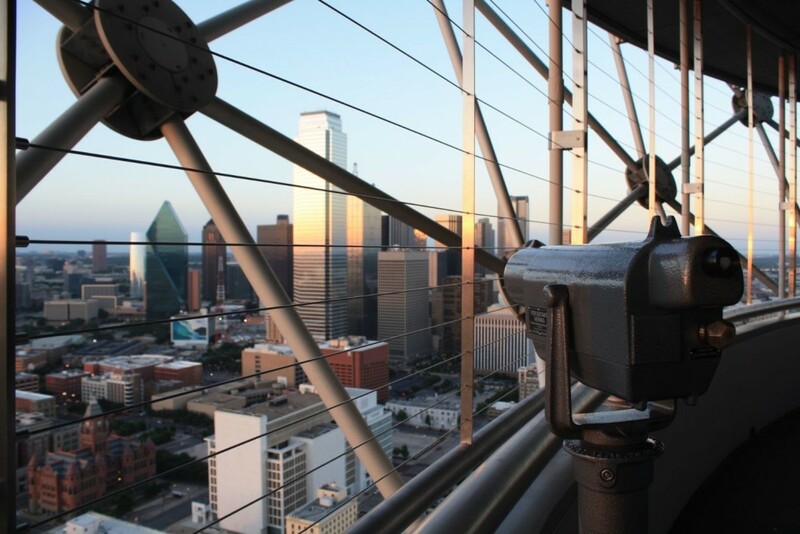 The Dallas skyline is beautiful from the ground, but the view from almost 600 feet up is on a whole other level. The Tower recently reopened in 2013 after renovations of the three main floors at the top were completed. The top two floors hold restaurants, Five Sixty and Cloud 9, which we’ll get to in a second. The bottom of the three top stories of the building houses the Geo-Deck, my personal favorite. The Geo-Deck offers a 360 degree view of the city offering both indoor and outdoor views. The open-air, wrap-around deck gives you the sense of just how high up you are. Although there are security bars and safety gates, the altitude may prove too exciting for those with a serious fear of heights (me). The view itself gives you a solid idea of the layout of the city. On a clear day, you can see Fort Worth and the ballparks and football stadium in between. Inside there is an interactive, touch-screen computer system called HALO. The HALO system allows users to make sense of all the buildings and landmarks visible from the tower and provides useful information such as distances between sites, explanations of buildings, rivers, and landmarks, and points out places of interest that you might not know to look for otherwise. The useful computer system and the sweeping views of the city make the Geo-Deck a must-see first stop on any Dallas excursion. The top floor of the tower houses Wolfgang Puck’s fine dining restaurant, Five-Sixty. Named for the exact altitude at which the restaurant sits in the air, this restaurant offers a full 360-degree view of the city for every diner, though not all at once. The entire restaurant is built ona revolve that rotates the dining room one full revolution over the course of an hour. 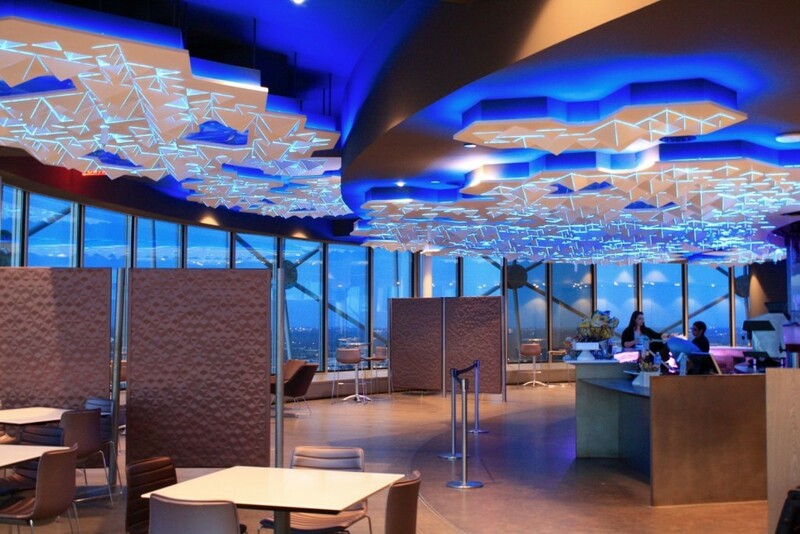 One level below Five-Sixty sits the Cloud Nine Café. Also the work of World-renowned chef Wolfgang Puck, Cloud Nine offers a more casual dining option for visitors to the tower. Both Five-Sixty and Cloud Nine Cafe offer a full bar. For those who don’t live in Dallas, while an incredible experience, visiting the tower during the day won’t quite allow you to fully appreciate “God’s Microphone” for what it is to the full-time residents. If you look closely, you can see a geodesic sphere made of aluminum struts forms the ball on top of Reunion Tower. At each of the 260 intersections of those aluminum bars are special LED lights that together turn the ball into a kind of spherical screen, which can be seen for miles. The ball normally sports different light patterns during an uneventful night, but the Tower really shines during citywide events, holidays and sports victories. Heading back to Dallas from a winning Ranger’s game, the Tower congratulates the entire city with a giant Texas Ranger’s “T” in blue and red. Maverick’s are in the playoffs? The word “MAVS” circles the ball in blue and green. There are always festive designs for holidays and special occasions as well. Reunion Tower has been in Dallas since the 70’s. We write posts about things like this because we get used to things that have always been there, and never taking the time to explore them would be such a shame. A 600-foot-tall, microphone-shaped tower can hide in plain sight unless someone reminds you to go up there and check it out. Go up just before the sunsets for cocktails at the bar. Take the kids to Tall Tale Story Time every Wednesday. Check out the Reunion Lawn Party that they have once a month featuring live bands, food trucks and a beer garden. Make sure to check out all of the events and promotions going on at the Tower. But be sure buy tickets online beforehand and use the promo code: COOLESTSTUFF to receive $2.00 off tickets!